The mobile software collaboration project between Intel and Nokia has yielded the first release of MeeGo for netbooks with version 1.0 now available for download. Earlier this year Intel and Nokia announced they would combine their Moblin and Maemo operating systems, respectively to create MeeGo for handheld devices, including netbooks, tablets and mobile phones. All three operating systems are Linux-based and MeeGo 1.0 ships with kernel 2.6.33, the new Btrfs file system and Qt 4.6. In announcing the release on the official MeeGo blog, technical steering group member Imad Sousou said the MeeGo Netbook user experience is the first to appear, with the development of the MeeGo Handset user experience coming in June. “We are now releasing the MeeGo API which includes Qt 4.6, the MeeGo SDK with an integrated application development environment, and various other operating system tools,” Sousou wrote. MeeGo has releases planned every six months with 1.1 due in October. Version 1.1 will include support for touch-based devices including in-vehicle entertainment systems. “The development tree for MeeGo v1.1 is now open and we will start releasing various components in the v1.1 tree, including opening the development of the handset user experience in June,” according to Sousou. MeeGo 1.0 is available for Atom-based netbooks and although Nokia has stated it will not allow users of its ARM-based N900 smartphone to use the operating system, the MeeGo 1.0 core software platform is now available for the N900. Nokia is more likely to ship MeeGo pre-installed on future handheld devices. In he meantime, it will continue to support for Maemo on the N900. 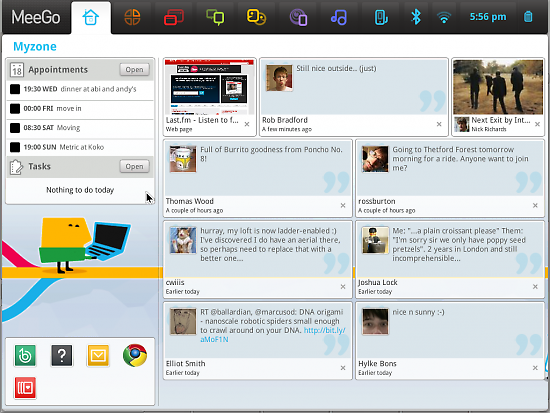 MeeGo integrates a suite of applications for mobile information management, including calendar, tasks, appointments, a media player and social networking updates on the home screen. For Internet access MeeGo integrates Google Chrome (Google Chromium is also provided) and the MeeGo Handset will use the Fennec Mozilla Browser.